When you think about space tourism, Virgin Galactic is probably the first and perhaps the only company to come to mind. But don't let the marketing budget fool you. Another Mojave-based company is in the race, and they're running it faster, cheaper, and more efficiently. XCOR Aerospace has been in the news since the late 1990s, founded and built by employees of other aerospace companies such as Rotary Rocket. One of their first projects was to build a rocket engine for the NeX1, a replica of the Bell X-1 flown by Chuck Yeager to break the sound barrier. Like many of the dot com companies of the era, other companies have since come and gone, but XCOR has remained. 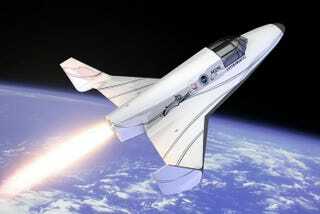 XCOR is now a commercial space plane and rocket builder, who is already booking suborbital flights on board its Lynx Mark I and Mark II reusable launch vehicles (RLVs) at only $95,000 and $100,000 respectively. The price tag drastically under-cuts Virgin Galactic's $250,000, and includes your health screening and all necessary training. XCOR's flights will take place from the new Midland-Odessa, Texas Spaceport. Just last Friday, XCOR began work on remodeling a hangar at the Midland airport (MAF) with work expected to be complete by next summer. Lynx is a two-seater, meaning your flight will include only the pilot and yourself. So if you have a loved one, or bunch of other friends for whom money is no object and also want to go to space, Virgin Galactic might still be your best bet. Popular Mechanics called the Lynx the "Space Corvette" in comparison to Virgin Galactic's Space Ship Two being called the "Space Minivan," in terms of seating. Lynx is designed to provide up to four flights per day. A true "space plane," Lynx will take off from a runway, using its own propulsion system. It will take its passengers traveling up to 100K meters high (330,000 feet), a mark also known as the Karman line, or the official edge of space. There is some cloudiness over whether Virgin Galactic will actually get their space tourists that high. I visited with XCOR recently at Mojave and got the chance to sit in the engineering mockup of the Lynx. Since you're in the cockpit with the pilot, (and if you can resist the urge to touch the buttons) you get a complete panoramic view from the giant cockpit windows, versus looking out a smaller airplane-style window on Virgin Galactic. I'm not here to dog on Virgin Galactic, because I've never flown them (obviously), but if you're looking to go to space, you should know there are options.